And there is no reason to limit this reflection to only ourselves. Remember the concept of disposable hearing aids? Absolutely visionary, but who knew our industry was so resistant to change. And what about the array of microphones worn on the chest? An extraordinary leap in performance, but far too costly for our sense of fashion. Sure, we have many opportunities to learn through failures. And in our industry, I believe we have applied these failures in a constructive manner, to make hearing aids work better. 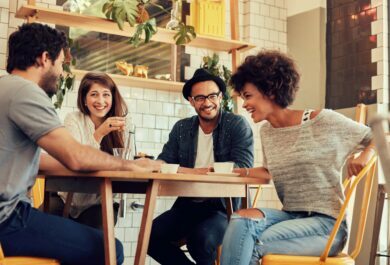 It wasn`t that long ago that I remember watching everyone`s hand immediately move to adjust their hearing aids, when a loud sound suddenly occurred. Technology back then was horrible at handling impulse sounds as gain was applied linearly, and wearers often had to adjust their volume control to higher levels to address audibility of soft sounds. Even average sounds could spark the hand-ear control reflex! Gain models available in current technology are considerably more elaborate with multiple compression knee points and time constants. Noises can be quickly and differently compressed, depending on the duration of the noise. Noise can even be eliminated in the time domain before being processed by the hearing aid – an extraordinary achievement. I haven`t seen hand-ear reflex for more than a decade, so I’m convinced that these clever innovations are successes. What about the whistling hearing aids? Never music to my ears, and always provoked the same emotional response as that of a crying baby. In my opinion, whistling hearing aids represented one of the notable industry mishaps. 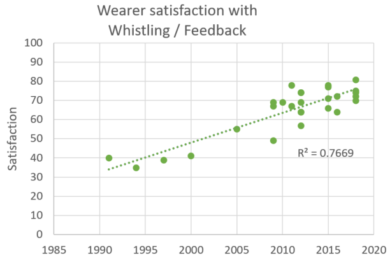 Recall wearer satisfaction with whistling/feedback in the early 1990s hovered around 40%.1 Not surprising was an overall low wearer satisfaction (50%), and an unimpressive market penetration. Whistling hearing aids could perhaps be one of the most negative stigmas. Look how far we’ve come in Figure 1. While wearer satisfaction on this dimension was around 40% in the early 1990s in the USA, we now have global data showing wearer satisfaction near 80%! 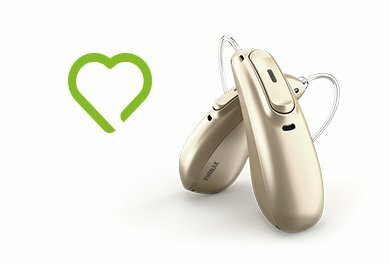 These high satisfaction levels really reflect the successful partnerships with hearing care professionals, to solve a significant issue facing wearers (R² = 0.77). Feedback is a natural phenomenon which occurs whenever a microphone and speaker are near. Audiological care has evolved to minimize through more impactful counselling, better fitting shells, proactive ear wax management and ongoing hearing aid maintenance. 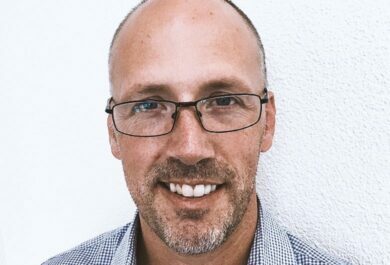 Innovation has its role in launching feedback algorithms on more advanced platforms. Algorithms often work in concert. Systematically increasing gain at different frequencies provides an accurate measure of acoustic fit and pre-sets gain below feedback levels. Acoustic fit is continuously monitored for presence of sound from the receiver and eliminated. Yes, there are a few instances where acoustic fit can be dramatically altered but the few seconds required to react, have little impact on wearer satisfaction. More micro improvements will always be appreciated, but this data speaks for success. Feedback is to a large extent, quite simply, a problem of the past! What do these successes mean? It’s a good rule to celebrate successes. We do, and this celebrating has motivated us to stretch for success in other areas with our latest Marvel technology. What will success look like in 2025, 2030? It’s still too early to tell but I’m keen to learn, especially given our industry`s success with addressing feedback and comfort with loud sounds. You liked this article? Then give it a (9)! No comments on “Whistling hearing aids? A problem of the past.”, yet.